This one is an amazing 'Foxhole Radio' (AM receiver). The radio needs almost NO special electronics components. 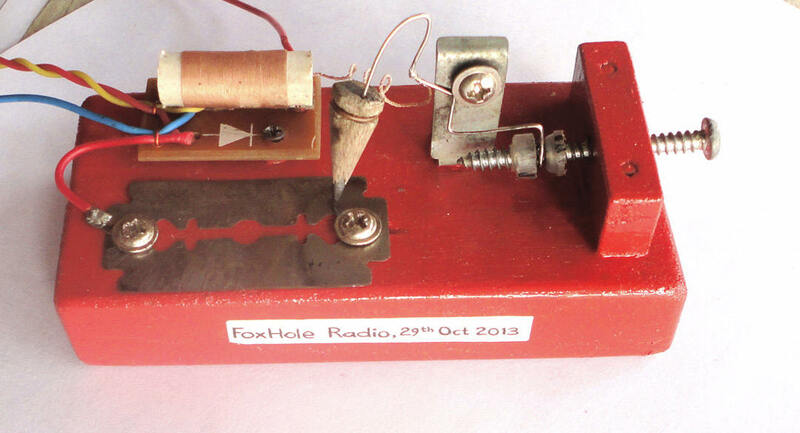 We can make it using normal home stuff- a coil, a rusty (oxidized) razor blade and a tiny piece of pencil and the radio needs NO battery power. To make Crystal Radio we need special crystal or special germanium diode. But to make this Foxhole Radio we need no special diode! An amazing thing- here, a rusty razor blade and a piece of pencil is a diode. I made the blade 'rusty' by burning just a minute on gas stove (may be bad with oil stove or wood fire). After heating the blade, you will get 'Blue' colored blade and it is a semiconductor layer which will make a diode. We have to find a diode junction by moving (searching) the pencil carefully on the surface of blade, be patient! It is not too easy to get a diode junction. I prepared 4 blades but found the junction at first attempt. I measured forward voltage drop across this 'home made diode' and got around 450 mV to 550 mV after better adjustment. The voltage drop of the diode is very similar with germanium diode. I can adjust the pressure of pencil on the blade by adjusting screw (right one). It is better to adjust the pressure of pencil to make a good diode junction for maximum audio output. The entire radio needs earth ground and VERY long antenna (wire) like a crystal radio. Overall audio performance is little Low than crystal radio made by germanium diode. Due to this poor and and non qualified home made diode, sound is small. So compulsory you need to use high sensitive earpiece like 'crystal earpiece' or have to use tiny audio amplifier (links are below). I have extremely sensitive cell phone earphone and I heard VERY low level sound. Actually this is an old idea and the idea is called 'father of semiconductor' because scientists found semiconductor like this way by experimenting various materials. Here are some unusual detector ideas for a "Crystal" radio.